Tour guiding is sometimes odd. I love Munich. I lived there for ten years…my wife is from Munich, my son is from Munich…and well, I spent many hundreds of hours walking its streets in some sort of a weird “Lost in Translation” sort of thing. Anyway, friends of ours are going to visit Munich this year and one of my first thoughts was that they are odd tourists who might want to see and do things that the average tourist probably would never stumble into. SO, that being said, I’m going to start posting somewhat random places that I think are interesting in Munich. Some might be interesting to you, some might not…we’ll see. Oh, what about the picture at the top? That has nothing to do with this post as it’s 2 hours South-West of Munich and you know all about it anyway…but it got your attention. Anyway, below is my first one. This is a statue that most tourists don’t see because of its location…except maybe during the Oktoberfest. Holy Roman Emperor Ludwig IV “The Bavarian” used to get quite a lot of attention on some of my tours, but unfortunately all I could show tourists, as far as statues of the man himself, was a dismal one outside of his former castle, The Alter Hof (map). This entry was posted in Sights and tagged Germany, Ludwig, Munich, Oktoberfest, sights, statue, Tour on January 24, 2018 by NOFXmike. The season is almost here and I’m as excited about it as any of you tourists out there. If you want the no-hassle all-in tour from Munich, please visit Radius Tours and book there. Once you have booked the tour, please stop by the office at least 5 minutes before the tour to trade the print-out for a real ticket and then you’re all set to go. The tour costs €35…which includes all transportation to Augsburg and back to Munich. The meeting time is 9:45am and it returns at 6pm. This entry was posted in tours and tagged Augsburg, English, Munich, Radius Tours, Tour, train on March 21, 2011 by NOFXmike. As of April 1st, I’ll be doing Augsburg tours every Tuesday and Friday. Why Augsburg? Well, it’s the most historically significant place within a few hours of Munich, in fact it’s well over a thousand years older than Munich with the sights to prove it! 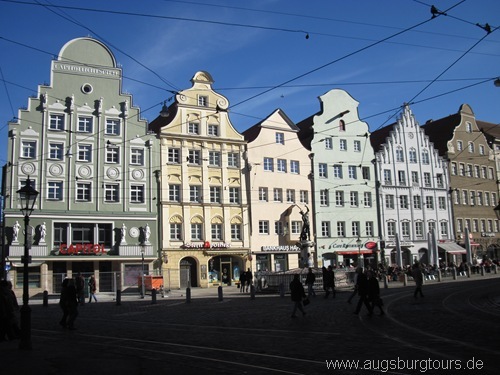 Founded in 15BC by the order of Augustus Caesar, Augsburg really hit its peak during the 1500’s when it was a free imperial city at the center of the largest trading organization on earth. The Fugger family was, without question, the wealthiest family in the world and they along with their rivals the Welser family, pretty much ran the city of Augsburg. At that time of course Augsburg was the big city and Munich was the small unimportant town. Even Vienna’s importance paled in comparison. The great thing is Augsburg never had a collapse so that even today you can see how amazing Augsburg was because everything is still there and looking great. More info will be posted soon along with a website dedicated to the tour itself! This entry was posted in tours and tagged Augsburg, Bavaria, Germany, Munich, Red Gate, Roman, Tour, Tours on March 8, 2011 by NOFXmike.